The Internet is a network of networks. Every machine that is connected to the Internet is part of a network. At home, you are likely connected to an Internet Service Provider (ISP). At work, your computer is part of the organization’s local area network (LAN), a network that is owned and managed by the organization you work for. This LAN must be connected to an ISP for your computer to communicate with others outside your organization. ISPs are communication companies that have extended network infrastructure spanning a wide geographic area. ISPs also need to connect to each other to be able reach regional, national, and global customers. The is not different from the way traditional phone companies connect to each other in order to facilitate national and international calls. In fact, many ISPs today are commercial phone companies that use their extensive infrastructure to reach a large customer base. Therefore, the Internet consists of a vast number of ISPs connected in a hierarchical structure in which smaller ISPs connect to a larger upstream ISPs. ISPs may also engage in business and technical arrangements with other ISPs, called peering, to exchange data traffic without charging fees. ISPs requiring no upstream links and connect only to customers and peers are called Tier 1 ISPs. An ISP’s infrastructure typically consists of a number of a Point of Presences (POPs) that covers several regions. The POP serves as a hub that connects local customers to the ISP’s network. The POPs are interconnected via a web of backbone links that are capable of carrying large amount of data over long distances. Technologies such as SONET, ATM, or Ethernet over optical fibre are typically used in the backbone. Digital Subscriber Line (DSL): utilizes existing telephone twisted pair lines that can be found virtually in every home. Cable modem for data: uses the coaxial cable technologies that traditionally were used to broadcast television signals. Wireless: uses technologies such as Wi-Fi, Wi-MAX, Cellular, or satellite. FFTx (Fibre to the Home/curb/premise/etc. ): several technologies are available to deliver data over optical fiber. 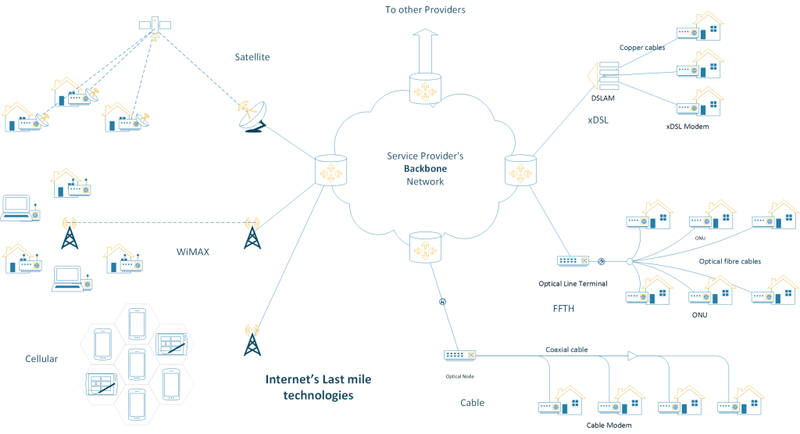 Lower data rates: relative to the backbone technologies, most last-mile technologies offer data rates that do not exceed 1Gbps. The effective data rates for end users may be much lower due to sharing of the bandwidth. Asymmetric data rates: due to technology limitations and deployment scenarios, most last-mile technologies offer higher rate in the downstream directions (from the Internet) than the upstream direction. This is consistent with the general use pattern where users consume more bandwidth (in the form webpages or media content download) than what they produce. Form conversion: a modem is required to transmit and receive data over different media using electric signals, optical pulses, or electromagnetic waves. The modem represents the interface between the home user and the service provider. The CANARIE Network. This network is Canada’s National Research and Education Network (NREN) formed by the twelve Canadian provincial and territorial governments. This powerful digital infrastructure is built to connect Canada’s researchers, educators and innovators at speeds up to 100 Gigabits per second. The Valley Community Fibre Network (VCFN). The VCFN is 186-Kilometer fibre network jointly owned by six municipalities and two educational institutions in the province of Nova Scotia, Canada. In addition to its owners, the VCFN also serves organizations from the educational, health, research, and business sectors.